"ML.... all of the tooling and education in the world doesn’t change the fact that you still need data to build models. This illustrates why we need data-as-a-service." so that machines and humans can answer society's toughest questions." "Azure Event Grid is an intelligent event routing service that enables you to react to notifications from apps and services. The Event Hubs Capture and Event Grid sample shows how to use Azure Event Hubs Capture with Azure Event Grid to seamlessly migrate data from an event hub to a SQL Data Warehouse." "All the files available in LottieFiles are distributed under Creative Commons (CC) Attribution (BY) unless stated otherwise." "Lottie is a mobile library for Web, and iOS that parses Adobe After Effects animations exported as json with Bodymovin and renders them natively on mobile!" "Lottie is an iOS, Android, and React Native library that renders After Effects animations in real time, allowing apps to use animations as easily as they use static images." by leveraging Mono runtime cross-compiled for Web Assembly (Wasm). It is a generic tool with a clever architecture, example of open web innovation. Just because it could be done. "Write interactive web apps in C# and F#"
"Support for Golang on the Wasm platform will be added in a series of commits to the golang base. The first in the series landed on March 31st 2018, and aims to add WebAssembly as an architecture target to the Go programming language." "NATS Server is a simple, high performance open source messaging system for cloud native applications, IoT messaging, and microservices architectures. 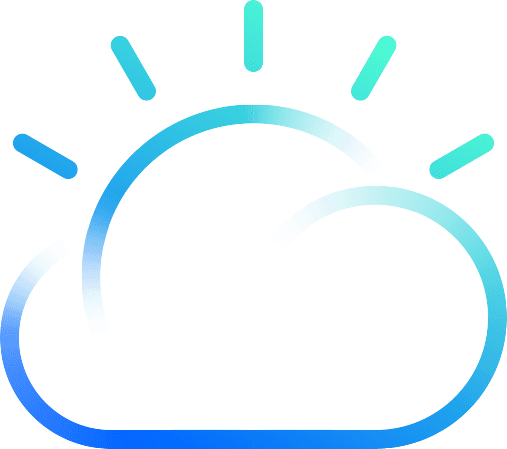 We are a Cloud Native Computing Foundation member project. Members of the Synadia team created the NATS Server (written in Go), NATS Streaming, and clients written in Python, Ruby, Node.js, Elixir, Java, NGINX, C, and C#." Derek Collison has worked on messaging infrastructure for 25 years. He started at TIBCO, then spent time at Google and VMWare. When he was at VMWare, he architected the open source platform Cloud Foundry. While working on Cloud Foundry, Derek developed NATS, a messaging control plane." 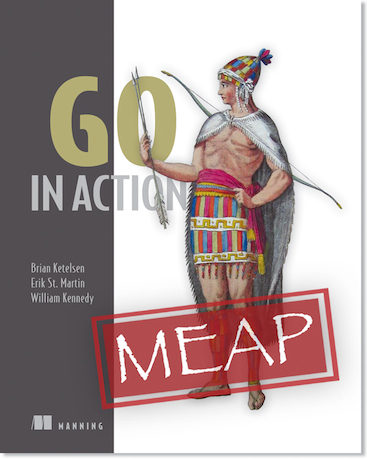 "A High Performance NATS Server written in Go and hosted by the Cloud Native Computing Foundation (CNCF)." Public cloud storage solutions are custom / proprietary. Similar, but each one is different. "File, Block, and Object Storage Services for your Cloud-Native Environments"
"Rook is an open source orchestrator for distributed storage systems running in cloud native environments. Rook is currently in alpha state and has focused initially on orchestrating Ceph on-top of Kubernetes. Ceph is a distributed storage system that provides file, block and object storage and is deployed in large scale production clusters." CloudFlare is most often associated with CDN and DDoS protection services it provides. instead of default DNS provided by internet providers. ...What many Internet users don't realize is that even if you're visiting a website that is encrypted — has the little green lock in your browser — that doesn't keep your DNS resolver from knowing the identity of all the sites you visit. That means, by default, your ISP, every wifi network you've connected to, and your mobile network provider have a list of every site you've visited while using them." CloudFlare's 1.1.1.1 outperformed any of the other consumer DNS services available (including Google's 8.8.8.8). It is not quite clear how this "free books" works, are those pre-final version or this is maybe done in collaboration with authors and publishers? A very informative podcast, in-depth interviews with interesting people, daily! Microsoft is working on bringing containers orchestration to "private cloud" on Azure Stack. That can simplify deployment and management of containers on premise also. "Google SVP of Engineering in charge of search and artificial intelligence John Giannandrea announced his departure from the company. Now the reason for that departure is clear: he's been hired by Apple to lead the company's "machine learning and A.I. strategy," reporting directly to CEO Tim Cook." "Freebase was a large collaborative knowledge base consisting of data composed mainly by its community members. It was an online collection of structured data harvested from many sources, including individual, user-submitted wiki contributions. Freebase aimed to create a global resource that allowed people (and machines) to access common information more effectively. It was developed by the American software company Metaweb and ran publicly since March 2007. Metaweb was acquired by Google"
"John Giannandrea, formerly Chief Technologist at Tellme Networks and Chief Technologist of the Web browser group at Netscape/AOL, was Chief Technology Officer." "CockroachDB, has been compared to Google's Spanner database. CockroachDB is an open-sourced software project that is designed to store copies of data in multiple locations in order to deliver requested data when needed. It is described as a scalable, consistently-replicated, transactional datastore. "CockroachDB, an open-source database built using a Google whitepaper on Spanner"
"Launched last year, Google’s AIY Projects are simple hardware kits for building AI-powered devices like an Assistant speaker and a camera with image recognition capabilities. With a clear use case in schools and STEM, Google is releasing updated 2018 kits that are easier to assemble and more widely available." "Stack Overflow will be ten years old soon"
"eBook for Microsoft titled Architecting Modern Web Applications with ASP.NET Core and Microsoft Azure. It’s part of the .NET Application Architecture guidance portal on Microsoft.com." "Take a structured approach to designing your cloud applications. This cloud computing architecture e-book focuses on architecture, design, and implementation—considerations that apply no matter which cloud platform you choose." to simplify deployment with containers. "Metaparticle is a standard library for cloud native applications on Kubernetes. The goals of the Metaparticle project are to democratize the development of distributed systems. Metaparticle achieves this by providing simple, but powerful building blocks, built on top of containers and Kubernetes." Rather than being external, container features become available as a program library (i.e. .NET attributes) to be referenced from the code and used at runtime. GDPR rules apply to sites used by residents of EU, essentially the whole world. "...EU’s General Data Protection Regulation (GDPR) not only comes into effect, but actually produces a body of precedents on what exactly constitutes a violation subject to a fine (which, remember, can be as high as €20 million or 4% of annual global turnover, whichever is greater)..."
"The European Union’s General Data Protection Regulation (GDPR) protects European Union data subjects' fundamental right to privacy and the protection of personal data. It introduces robust requirements that will raise and harmonize standards for data protection, security, and compliance." "On 25 May 2018, the most significant piece of European data protection legislation to be introduced in 20 years will come into force. 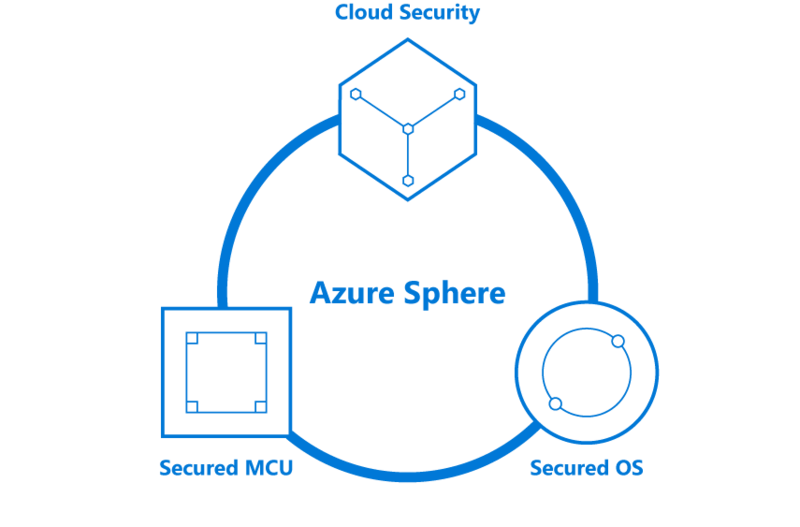 The EU General Data Protection Regulation (GDPR)..."
Azure Sphere OS: This OS is purpose-built to offer unequalled security and agility. Unlike the RTOSes common to MCUs today, our defense-in-depth IoT OS offers multiple layers of security. It combines security innovations pioneered in Windows, a security monitor, and a custom Linux kernel to create a highly-secured software environment and a trustworthy platform for new IoT experiences. 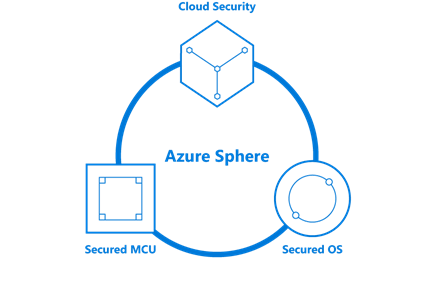 Azure Sphere Security Service: (Cloud)"
"Microsoft introduced Azure Sphere during the RSA security conference in San Francisco. It’s essentially a platform connecting microcontroller units (MCU) within Internet of Thing devices to the cloud. What’s notable about this announcement is that the operating system installed on the MCUs aren’t based on Windows 10 as you would expect, but rather a custom build of the open-source Linux operating system. That’s a first for Microsoft." 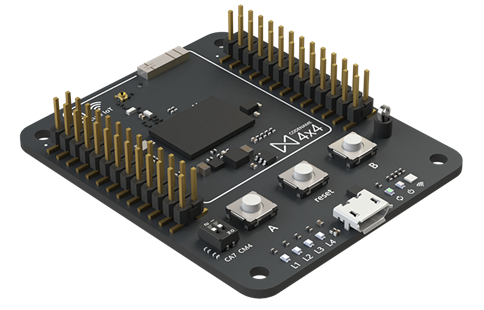 "It’s a “crossover” chip that combines the benefits of ARM-based Cortex-A and Cortex-M processor cores." "...there’s a key reason why Microsoft likely went with Linux instead of its in-house baked Windows 10: Open source. According to Microsoft, Azure Sphere is “open to additional software innovation” by the open source community. It’s also open to work with any cloud, not just Microsoft’s Azure-branded platform. Even more, the chip design can be used by any manufacturer absolutely free." "With the adoption of promises, D3 now uses the Fetch API instead of XMLHttpRequest: the d3-request module has been replaced by d3-fetch. Fetch supports many powerful new features, such as streaming responses." "With S3... individual objects can be as large as 5 terabytes. Data in object storage have traditionally been accessed as a whole entities, meaning when you ask for a 5 gigabyte object you get all 5 gigabytes. It’s the nature of object storage. Today we’re challenging that paradigm by announcing two new capabilities for S3 and Glacier that allow you to use simple SQL expressions to pull out only the bytes you need from those objects. This fundamentally enhances virtually every application that accesses objects in S3 or Glacier." "As an (Python) example, let’s imagine you’re a developer at a large retailer and you need to analyze the weekly sales data from a single store, but the data for all 200 stores is saved in a new GZIP-ed CSV every day. Without S3 Select, you would need to download, decompress and process the entire CSV to get the data you needed. 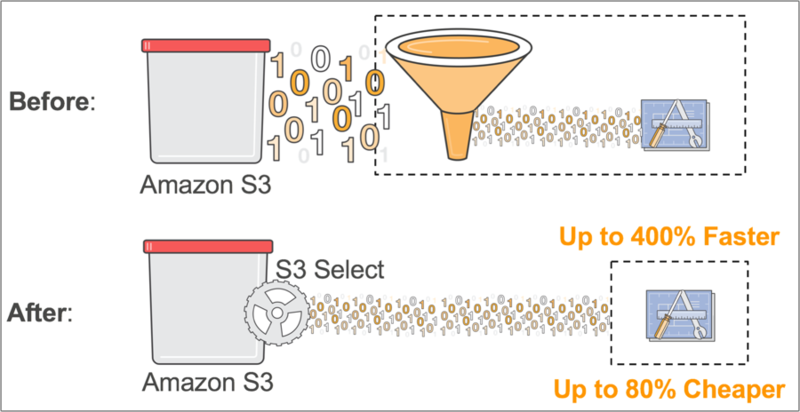 With S3 Select, you can use a simple SQL expression to return only the data from the store you’re interested in, instead of retrieving the entire object." "Azure IoT Edge is designed to run on multiple platforms (Windows and many versions of Linux), and hardware architectures (x64 and ARM). To deploy workloads, Azure IoT Edge can use Linux Containers for Docker or Windows Containers for Docker, with an open design to incorporate number of popular container management systems." "Azure IoT Edge is an Internet of Things (IoT) service that builds on top of IoT Hub. This service is meant for customers who want to analyze data on devices, a.k.a. "at the edge", instead of in the cloud. By moving parts of your workload to the edge, your devices can spend less time sending messages to the cloud and react more quickly to changes in status." A module image is a package containing the software that defines a module. A module instance is the specific unit of computation running the module image on an IoT Edge device. The module instance is started by the IoT Edge runtime. A module identity is a piece of information (including security credentials) stored in IoT Hub, that is associated to each module instance. A module twin is a JSON document stored in IoT Hub, that contains state information for a module instance, including metadata, configurations, and conditions." "Edge Hub facilitates module to module communication. 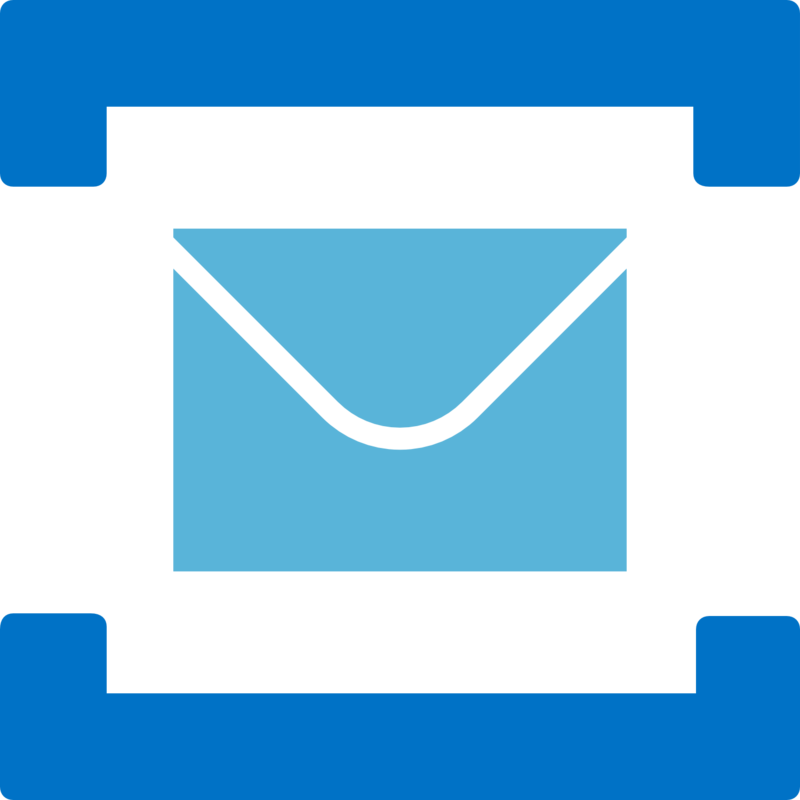 Using Edge Hub as a message broker keeps modules independent from each other. The IoT Edge agent is the other module that makes up the Azure IoT Edge runtime. It is responsible for instantiating modules, ensuring that they continue to run, and reporting the status of the modules back to IoT Hub." "Local compute, messaging, data caching, sync, and ML inference capabilities for connected devices. Run IoT applications seamlessly across the AWS cloud and local devices using AWS Lambda and AWS IoT Core." Just observed Google Cloud Platform "fancy" new logo..
"To be clear, this is NOT a new Portal, and it IS very low level. This is a tool for folks who want to know what's really going on when an Azure API is called."